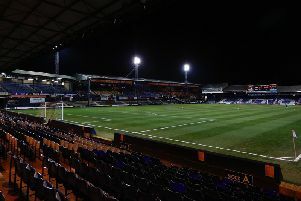 Luton Town chairman David Wilkinson has warned that without a new ground being built at Power Court, the club could cease to exist. Speaking at the club’s civic reception this afternoon, Wilkinson, who was officially appointed to his post last month, after serving as deputy chairman, voiced his concerns when addressing the massed ranks of Town supporters. He said: “I’ve been going 60 years, we need another 60 years. The club have submitted a double planning application for a new stadium at Power Court, plus a mixed use scheme at Newlands Park, the latter met by opposition from the Mall owners Capital & Regional, who last summer, threatened to 'kick it into the long grass'. Luton Borough Council have confirmed they will look at the plans in the week commencing August 20 and chief executive Gary Sweet is desperate for a green light to start building, but urged fans they will have to play their part once more. He said: “The future is we’re going to get a double this year I hope, which is one more victory and that victory we want is from that building over there (Luton Town Hall), but that is our future, that is our only future. Deputy leader of the council Sian Timoney, who was met with chants of ‘we want our stadium’ when she took to the stage also publicly threw her support behind the project, as when asked if the future was orange, she added: “It very much is. “Luton Town Football Club is so integral to the town, it’s so important to us. If you ask anybody who doesn’t come for the town, what do they know about Luton? They’ll say two things, the airport and Luton Town Football Club. “They’re a family club and they’re deeply embedded in the community and they’re really ambitious, not just to get your team further up, next stop the Championship, but also they’re ambitious for the town and for me, that’s the most important thing.